← What is it that’s being aborted? The short answer to the title question: “Is Abortion Eugenics?” is: Yes, abortion (i.e., contemporary abortion-choice policy) can qualify as eugenics wherever a children-in-utero is intentionally terminated for any number of reasons deemed ‘defects’ in the child. Preliminary reasons for this answer are that (1) eugenic abortion is a standing legal term describing any abortions conducted for eugenic reasons; (2) the concept of eugenics never required the coercive laws and pseudo-science with which it was associated in the early 20th century; (3) the onset of genetic testing has greatly enabled our predictive ability regarding fetal health, thus giving us a window of opportunity to abort a child before he or she is born with a genetic defect; and (4) and even with non-genetic defects–that is, traits which aren’t transferred to the child’s future offspring–these are still, by definition, defects and would qualify a child as “defective offspring”, thus satisfying the minimum criteria for eugenic target practice. Aborting such children-in-utero due to their perceived “defects” would still be an effort to improve the “stock” of the next generation of children, and so would qualify as eugenics at least in the broadest conceptual sense of eugenics. [W]ith questions bearing on what is termed in Greek, eugenes namely, good in stock, hereditarily endowed with noble qualities. This, and the allied words, eugeneia, etc., are equally applicable to men, brutes, and plants. We greatly want a brief word to express the science of improving stock, which is by no means confine to questions of judicious mating, but which, especially in the case of man, takes cognisance of all influences that tend in however remote a degree to give to the more suitable races or strains of blood a better chance of prevailing speedily over the less suitable than they otherwise would have had. The word eugenics would sufficiently express the idea; it is at least a neater word and a more generalised one than viriculture which I once ventured to use. [Francis Galton, “Human Faculty,” (1883), pg. 17; emphasis mine]. Galton was not dealing in a “new” concept, but rather a new application of an old concept. Eugenics was already at play in animal husbandry. It was not common at the time, however, to think of mankind as merely another species of animal. the more common view was some brand of creation doctrine (whether biblical, deistic, or otherwise). Creation doctrine was common in the 19th century, even among top tier scientists, and while that doesn’t require any single religious or textual tradition, it does tend to set apart mankind as a “special creation” innately distinct from the other animals. But creation doctrine met it’s stiffest competition in 1859 when Charles Darwin published Origin of Species. Soon Darwins model of evolution skyrocketed to the top of international scientific interests. As Darwin’s theories saturated the market, mankind was increasingly seen in dimmer (and fiercer) lights. Man was thought to be on the same living continuum with the other animals, not some “specially created” entity radically distinct from other animals. 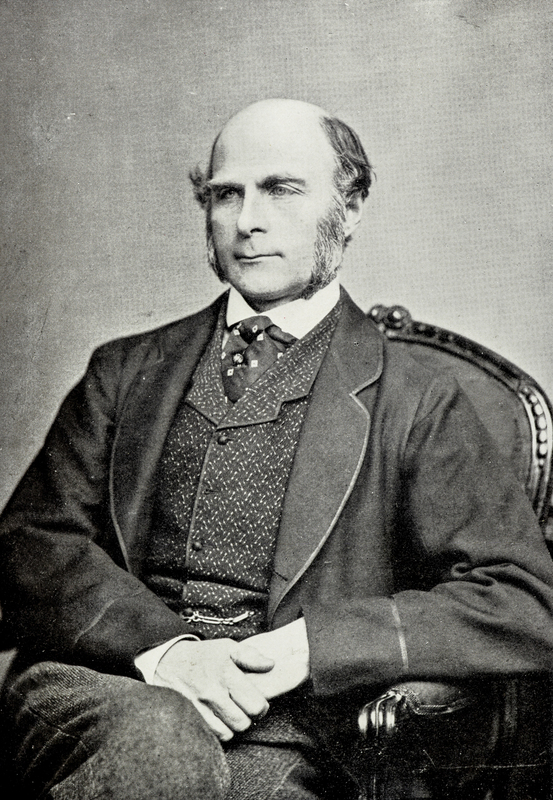 Under this new paradigm, it was only natural for Galton to transition in thought from animal husbandry to human breeding. The same goes for Darwin. His follow-up book, Descent of Man (1972) is riddled with the “good breeding” rhetoric seen later in Galton’s writing (see, John West, Darwin Day in America , pgs. 31-33, 128-130). But the early notion of eugenics veers far wide of the modern definition of eugenics. In the late 19th and early 20th century, eugenicists tended to define “eugenics” with reference to heredity generally, and not genetics specifically. They lacked the hard science to narrow down “heredity” to genetic factors, yet instead of proceeding with caution and humility, they instead marched boldly forward entwining eugenics with overtly racist agendas (ala, Hitler’s “racial hygiene” program), and ad hoc/pseudoscientific theories like phrenology (the study of personality/character via skull shape). Early eugenics programs also earned great scorn by operating within a context of forced sterilization, a practice that has since been judicially overturned (Skinner vs. Oklahma ). For these reasons it’s clear why eugenics has a bad reputation and would be a slanderous accusation today. In summary so far, eugenics refers to the theory and practices involved in generating “good stock” of human progeny, whether in one generation or in many future generations. Eugenics was conducted as a “science” but much of it has been shown to be pseudoscience (including scientific racism, phrenology, and hereditary poverty, etc.) Eugenics may be positive, encouraging “good” parents to breed; or negative, discouraging “bad” parents from breeding. We’ll call this the “broad sense” of eugenics. the early eugenicists tended to include race and poverty in their estimations of “good” and “bad” stock, and they were even able to pass U.S. law institutionally approving forced sterilization for “defective” people, as they were deemed unfit to breed. We should point out, that the “broad sense” allows for, but doesn’t require, eugenics to be a science, that is, a clinical field of study and practice dealing in objective facts and practices. But even if it were proven to be pseudoscience, eugenics would still be about “improving human stock.” Eugenics is also affiliated with sterilization practices, as that was once a popular means of eugenics. 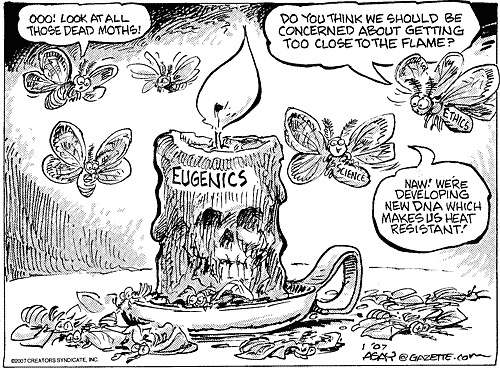 But, even if other means were used–such as abortion, euthanasia, infanticide, or even death camps–it would still be eugenics if it actually or was intended to achieve (what was thought to be) “improved human stock.” Also, eugenics is often associated with coercion, such as forced sterilization. But again, it would still be eugenics if people voluntarily underwent sterilization or conducted their mating practices according to eugenic principles. We should also note that the parallels between animal husbandry and human breeding practices are only rough parallels. In animal husbandry it’s not uncommon to kill feeble newborns or relatively healthy but older members of the herd. Obviously, Hitler’s “racial hygiene” program–which included these sorts of practices–would qualify as “eugenics.” But that extreme use of e ugenic theory was never normalized in the U.S. Nevertheless, eugenics can refer to any measures whatsoever which are intended to socially engineer improved stock on a human population, but the term appears to also be used in a narrower sense, in reference to the ideology, laws and practices which composed the sterilization laws of the early 20th century. Duhaime’s broadness is important for legal purposes. In the court of law, medical and scientific nuances are not necessarily in focus. A defendant could be aborting her child for eugenic concerns (broadly) irrespective of the more “evolved” or scientifically informed notions of heredity. She could ascribe even to the “racial hygiene” ideas of White supremicists, and consider her child unworthy of life for being the product of a racially mixed father. For legal purposes, the broad definition of eugenics, and eugenic abortion, is important lest our court system definitionally exclude real causal forces. That is, people may believe pseudoscientific theories, or ascribe to a racist worldview, or have otherwise distorted ideas about heredity and what counts as “good birth.” Or they could even kill their unborn child because of concerns about environment and culture. And regardless of how legitimate or illegitimate these beliefs may be, they can causally affect people’s reproductive choices. This legal definition therefor refrains from ruling unnecessarily on these details thus allowing litigants to hash it out in future cases. Still another reason for rejecting the strictly “genetic” sense of eugenics is that in the U.S. and especially in Germany, eugenics are argued on the basis of the burdening impact of handicapped or otherwise “defective” offspring on society. Whether a trait is genetically based or not is secondary to the fact that a particular child is still considered a burden to society and a poor use of resources. This “burden” is especially heavy, and precariously positioned, in countries with socialized healthcare, government welfare, and otherwise federally funded social programs where the tax burden for these “undesirables” is spread out across populations of people who don’t necessarily want to see their tax dollars funding someone else’s “irresponsible” family planning practices. Children who have non-heritable conditions which nonetheless restrict their ability to serve productively in military or in the labor force are still seen, by this logic, as “burdens” to society. Countless bioethics journals and books follow suit forewarning about the intersection of eugenics and more recent genetic technology such as genetic testing and genetic engineering in one’s offspring (for example, see here, here, and here). It is safe to say that the genetic sense of “eugenics” is the normal sense of the term today. The American Eugenics Society survived for decades after WWII, even though institutionalized eugenics (meaning sterilization programs) was banned. When Watson and Crick pioneered the theory of DNA, uncovering it’s mysterious linguistic code in 1953, the notion of “heredity” underwent a monumental shift. Sure, genetics was a standing convention in the sciences by that time, but DNA based genetics was now the scientific concensus–fully establishing Darwin’s model of evolution (including classical and Neo-Darwinism/Modern Synthesis) over and above alternative models like Larmarkism. The AES, at least since the 1942 Oklahoma vs. Skinner case, had every reason to adapt their “store front” version of eugenics to suit new discoveries and distance themselves from the more regrettable and unsavory affiliations (animal breeding, coercion, racism, etc.). Now, of course, genetics isn’t the only means of inheriting traits from one’s parents. There is also culture and environment, the “Nurture” part of the nature-nurture dichotomy. We see this adaptation in the work of one of the most famous eugenicists, Frederick Osborne (1889-1981) who presided over the AES in 1946 (after forced sterilization was banned), and in 1954 founded the journal Eugenics Quarterly (later, changed to Social Biology). He argued for a non-coercive, and scientifically neutral, brand of eugenic anthropology which dealt in culturally transmitted traits; indeed, he was skeptical of the “hereditarian” model which attributed most every socially derelict quality to biological heredity (source). We also know that non-genetic factors can influence gestation and development in pregnant mothers. The pregnant mother can impart anything traceable to the shared blood and nutrients with the fetal child, including any bacteria, viruses, or other contaminates that may enter through the umbilical cord. Where any of these blood-born contaminates are thought to be or cause “defective” status they would qualify as eugenics. A key example might be fetal-alcohol syndrome. These case would be eugenic in the looser sense of the term–as unseemly “burdens” on society. But if the reader finds that usage unsightly, it could be term “eugenics-like” as it’s follows similar logic and appears in the same ballpark with historic uses of the term (prior to modern genetics) but does not include the genetic component found in modern definitions. Eugenics is considered pseudoscience today, but it was once considered good sound science and that meant it’s reputation hung on its ability to keep pace with the best developments in hereditary science at the time, otherwise it would lose any persuasive claim on science. Put another way, eugenics itself evolved over time. 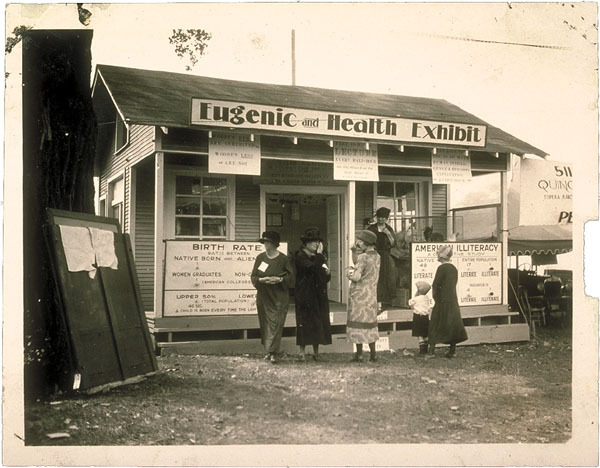 Eugenics, as a field of study and practice, adapted to survive the growing hostility against eugenics that arose in the mid to late 20th century. Numerous U.S. states had eugenics laws on the books between 1900-1941, and Hitler reportedly drew much of his inspiration from U.S. law codes in this respect. Hitler of course, died in infamy, and the ideological baggage of the 3rd Reich went down in infamy with him including his theories of “racial hygiene”, a brand of eugenics, which eventuated the death of millions of feeble and mentally ill people, Jews, Blacks, Gypsies, and other people deemed “defective.” Back in North America, U.S. eugenics laws were effectively dissolved with the combined impact of Hitler’s infamy and the Oklahoma vs. Skinner case of 1942 which ruled against the practice of forced sterilization. In still another sense, eugenics is, philosophically speaking, “the science of improving human populations.” And while that “improvement” is typically understood with reference to functionally advantageous or societally preferred genetically-based attributes, the genetic component is the commonly accepted means of heritable transference, genetics is not the intrinsic “end-goal” of eugenics. So long as a parent somehow passes on an effect to his or her child, then it is affecting the next generation–whether for one generation (i.e., non-genetic traits) or all future generations (i.e., genetic traits). Compared to the other two, the philosophic sense of eugenics is not so easy to discard. Sure we can still object to eugenic practice or eugenic laws , but we can hardly suggest that the theory is incoherent or that it’s neatly distinguished from abortion. So we return to the original question: Is abortion eugenics? The answer to this question depends on what kind of abortion we’re talking about. Some kinds of abortion are clearly selecting for “preferred” genetic lines, hence the ethical conundrum with fetal genetic testing (ex., amniocentesis). There is no real question about whether this sort of practice is common, for example, for Down Syndrome children-in-utero, or whether Down-Syndrome is a genetic condition, or whether Down-Syndrome people are able to reproduce later in life. Since all of these are facts, there exists a real and literal sense of “eugenics” in abortion. Hence we still have the somewhat contentious, but nonetheless accurate term “eugenic abortion” (Hummel vs. Reiss, 1991). A tricky middle ground can be found with non-genetic but still inherited “defective” traits (and “defective” could be any agreed-upon traits like gross deformity or really anything deemed as such in the eyes of the beholder). If a woman were to somehow harm her child-in-utero, for example, through fetal alcohol syndrome, drug addiction, or viral and bacterial contagions (or any effects therein) and she were to abort that child-in-utero she is still contributing to a “purer” stock of children. She’s “thinning the herd” of malformed, sick, feeble, or otherwise “defective” children. This practice is entirely consistent with the early notions of eugenics (Galton, et al.). And it’s only trivially different from modern “genetic” definitions of the term. Nowhere do the founders, or even the later fathers of the Eugenics movement require that a trait extend beyond one generation (thus qualifying as genetic heredity) before it can count as a “defect.” Some defects only affect the immediate generation, other defects commune across several generations. Eugenics is aimed against “defective” offspring, regardless of how transferrable that defect may be across multiple generations. What’s the answer? Abortion is clearly a means of eugenics, most explicitly in cases aborting genetically handicapped children-in-utero, such as down syndrome cases. Secondarily, abortion can also qualify as eugenics in the broader, classical sense of the term, wherever people are terminating the life of a child-in-utero to reduce the incidence of physiological or even psychological “defects” (however they define/understand the notion of “defect”). Third, eugenic abortion is a real and defensible term, as it describes the easily demonstrated fact that some people conduct abortions for the purpose of eliminating unwanted traits among the next generation of children. Fourth, we can admit that institutional coercion and “scientific” brands of eugenics have been overturned and their contribution to the larger concept of eugenics is effectively debunked–hopefully they are buried forever. There may persist scientifically neutral forms of eugenics, which do not import scientific racism or any other pseudoscience, but we have great reason to leave the worst excesses in the name of “eugenics” buried, never to see the light of day again. This entry was posted in Abortion Practices, Contraception Practices, Ethics of Abortion, Family Planning, History of Abortion, Terms and Definitions and tagged Abortion, eugenics, genetics, sterilization. Bookmark the permalink. 11 Responses to Is Abortion Eugenics? Abortion in response to FAS would also not qualify as eugenics. This is the key to our disagreement. Something that happens to a woman that affects her fetus is not “an inherited trait.” For example, the woman could be involved in an automobile accident, and the fetus could suffer debilitating neurological injuries as a result. The woman might decide to terminate her pregnancy because the fetus lacks neurological function. This would be an abortion, and it would be in response to something that happened to the woman that affected her fetus, but it would NOT be eugenics. That’s a fine opinion, and you aren’t alone in it. But I’ve made an evidential and rational case against your “narrow” definition of eugenics showing that it’s not the only usage for the term “eugenics” but is in fact misleading when treated as such. Indeed the term “eugenic abortion” is still in legal precedent and it describes abortion cases that you exclude thus proving there are eugenic uses of abortion which your terminology overlooks. Take note, for example, of the eugenics tree image in the article. Even when eugenicists were aware of genetics and DNA they still acknowledged a wide range of causal factors that could generate defects. You’ve made the case that considering anything other than genetic inheritance is supported only by out-dated, non-scientific sources. By doing so, you construct a straw man. An irrelevant straw man, in fact, because none of those poor sources describe anything like committing feticide in response to a highly morbid infection. So you haven’t made any kind of case, UNLESS you’re able to cite any kind of medical dictionary or peer-reviewed scientific literature agreeing that infection-prompted feticide is a kind of eugenics. Until then, I’ll share my fine opinion with the rest of the scientific community. It’s actually kind of a shame, because you COULD have used this article instead to make two related cases. 1) That contemporary abortion practices amount to a kind of “eugenics” based on the socioeconomic profile of women who seek terminations, and 2) That Zika infection-prompted abortions are immoral. I think you’d be wrong on both counts, but at least you would avoid the fallacies you’re mired in at present. Zach, also if the child is already brain dead then it’s not eugenics to expel an already dead fetus. I didn’t say the fetus was “brain dead,” I said that it suffered debilitating neurological injuries. Let’s say, for sake of example, that the neurological injuries were comparable to that observed with microcephaly. I have neither said nor implied that only genetically caused cases of microcephaly are “defects.” What I have said is that only the genetically caused cases of microcephaly, if prompting a termination of the fetus, would constitute eugenics. Zach, okay. According to the listed evidences in the article I’ve shown why the majority/narrow definition of eugenics should not be considered the only qualifying usage of the word “eugenics.” I have also showed how eugenic abortion is defined as terminating children-in-utero who are deemed “defective.” You’ve apparently granted the minimal criteria for eugenic abortion (“I have neither said nor implied that only genetically caused cases of microcephaly are “defects”). When that admission is applied to the “defect” of microcephaly, that means you are thereby admitting that there exists brand of eugenic abortion which you said is not eugenics.